Get a rare opportunity to play with some of the most likeable marine mammals. How about an adorable kiss or a splashtacular belly ride from a sleek, speedy dolphin? 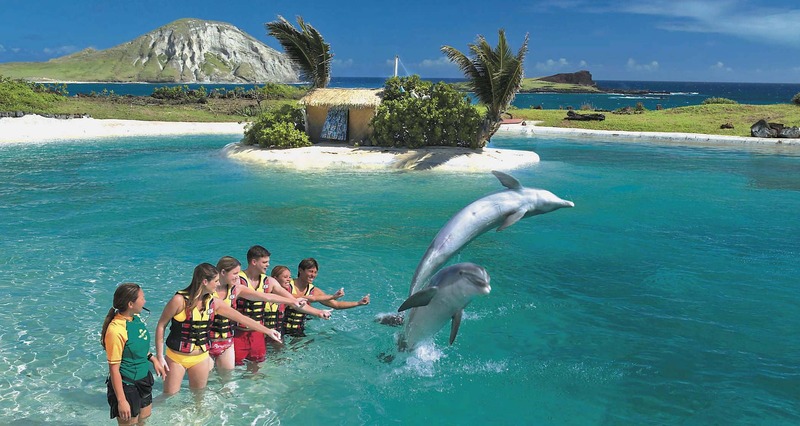 Visit Sea Life Park, which is located in Waimanalo Town on O'ahu's South Shore. After checking in, take an educational swim in the tank inhabited by the park's friendly dolphins and learn about their daily lives. Your new friends will take you on a thrilling belly ride and even share a friendly kiss with you. The encounter will last about 25 to 30 minutes. Please Note: Transportation is not available from Aulani Resort. View important additional information to help you prepare for this exciting adventure. Check-in time will be 30 minutes before the session. Sea Life Park reserves the right to sell the seat of any Guest who is not checked in on time. Enjoy the adventure together, as children (8 to 12 years of age) may participate, provided a parent is present in the water with them. Children 13 years of age and older may swim on their own during the program. Guests must be able to get in and out of the water on their own, and they must swim on their own in 18-feet-deep water. Bring your own towel and swimwear. Changing facilities and a rinse station are available at the park, but there are no shower facilities. For more details regarding this excursion, please contact Pleasant Activities at (800) 840-6820 from 7:00 AM to 6:00 PM Hawai'i Time daily. Visit the Holoholo Tours and Travel Desk in the Main Lobby from 7:00 AM to 6:00 PM daily.